An anti-inflammatory mask used for cooling and calming oily/acne skin. Excellent for treatment. Contains Bentonite and Kaolin, which are used to help absorb excess oils on the surface of the skin. 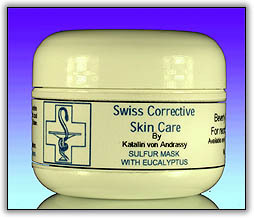 Sulfur helps to stimulate and heal, while eucalyptus oil is used for aroma and cooling. Apply a generous coat of product on cleansed entire affected area. Allow mask to dry for 20 minutes, then rinse with LUKE warm water. If skin feels dry, follow with Acne Moisture Balancing Cream. Sulfur 10%.3% Eucalyptus Deionized Water, Kaolin, Bentonite, Propylene Glycol, Magnesium Aluminum Silicate, Glycerin, Zinc Oxide, Eucalyptus Oil, Polysorbate-20, Titanium Dioxide, Diazolidinyl Urea, Methylparaben, Propylparaben.